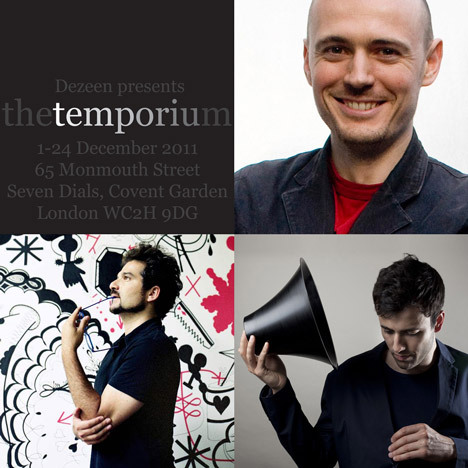 Designers including Jaime Hayon, Paul Cocksedge and Dominic Wilcox will create unique products and curate displays of their work at The Temporium, our Christmas shop taking place at 65 Monmouth Street in Seven Dials, Covent Garden, London from 1-24 December. Dominic Wilcox is creating a special black version of his English Civil War bowl (above) and a red version of his Battle of Waterloo bowl - both part of his classic War Bowls series made from melted toy soldiers. Wilcox is also selling some of his unique drawings (above). Jaime Hayon will curate a selection of glass and ceramic objects he has designed for various brands (above: porcelain for Kutani Choemon) and is working on a unique limited edition product that will only be on sale at The Temporium. Paul Cocksedge will present a special Christmas version of his Change the Record speaker (above), with a white label allowing customers to write their own message on the product before giving it as a gift. See our video interview with Paul about Change the Record. Dezeen Watch Store will also take part in The Temporium, selling our full collection of watches including Iconograph by Werner Aisslinger (above) plus we'll be selling our new book, Dezeen Book of Ideas (below), as well as our highly desirable T-shirts, bags and stickers! Other designers and brands confirmed for the store include jewellery designer Fiona Paxton (below), retailer Theo, designer low-energy bulb brand Plumen, retro phone-makers Hulger and furniture and lighting brand Matilda. Many more names and products will be announced over the coming weeks. There is still a limited amount of space remaining for designers who want to sell their products at The Temporium. The deadline for submissions is next Monday, 14 November. More details here.